November 6, 2018 -- By combining a robotic arm-assisted needle navigation system with PET/CT, researchers in India are performing more-accurate targeted biopsies for suspicious bone and bone marrow lesions with near-perfect diagnostic results, according to a study published online November 1 in the American Journal of Roentgenology. Patients have had minimal complications with the PET/CT-guided procedures, and the technique helped determine the appropriate course of treatment for more than 90% of the patients, the researchers found. "Automated robotic arm-assisted FDG-PET/CT-guided real-time bone biopsy is a feasible and safe intervention with a very high diagnostic yield," wrote lead author Dr. Rajender Kumar and colleagues from Nehru Hospital in Chandigarh. "It had a major clinical impact on patients with minimal residual FDG uptake on end-of-treatment PET/CT and isolated suspected metastatic lesions." While FDG-PET/CT has long played a role in cancer staging and the assessment of follow-up therapy, the hybrid modality is not tumor-specific, and benign lesions can exhibit high FDG avidity, prompting an unnecessary biopsy to confirm a diagnosis. More recently, PET/CT images have been used to guide percutaneous biopsies of suspicious marrow and bone lesions. "These biopsies are PET-directed but are not real-time PET/CT-guided biopsies," the authors wrote. "Robotic arm-assisted CT-guided sampling has also been shown to have a very good diagnostic accuracy. However, to our knowledge, the usefulness of real-time automated robotic arm-assisted PET/CT-guided biopsy of marrow and bone lesions has not yet been explored." To investigate this, the researchers performed a prospective study that included 73 patients (mean age, 48.5 years) who were referred for FDG-PET/CT imaging for FDG-avid marrow or skeletal lesions. A pathologic diagnosis was indeterminant for 38 patients (52%), although 31 (81%) were suspected of having cancer. 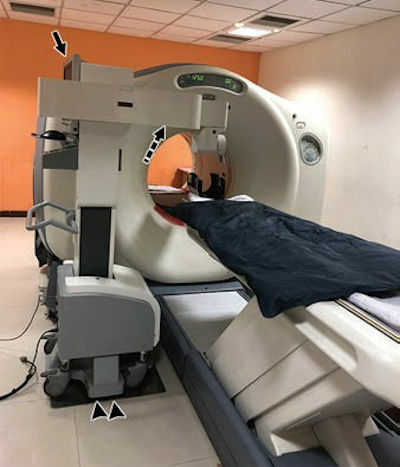 Whole-body PET/CT imaging was performed using a dedicated PET/CT scanner (Discovery STE 16, GE Healthcare) after administration of 300 MBq to 370 MBq of FDG. Clinicians reviewed the PET/CT images before the biopsies to assess the lesions based on FDG avidity, accessibility, and their relationship to critical organs. The robotic positioning system (Robio EX, Perfint Healthcare) features a mobile configuration that can be docked onto a floor panel next to the PET/CT gantry. Fused CT and PET images are loaded into the console, so clinicians can plan and direct the correct needle trajectory from the entry point on the skin to the bone surface and site of the FDG-avid lesion. The robotic arm is docked at the side of the PET/CT bed (arrowheads) console for planning (arrow). The dashed arrow shows the working arm of the robot. Image courtesy of AJR. The PET/CT-guided robotic arm technique proved quite accurate. First-time PET/CT-guided biopsies diagnosed 72 (98%) of the 73 lesions, which included 54 (72%) true-positive findings, 18 (25%) true-negative findings, no false-positive findings, and one (3%) false-negative finding. The lone undetected lesion was discovered on the second round of tissue sampling. PET/CT-guided biopsy had a sensitivity of 98%, specificity of 100%, positive predictive value of 100%, negative predictive value of 95%, and accuracy of 98% for detecting malignancy. In addition, the PET/CT-guided procedures were instrumental in determining a treatment plan for 67 cancer patients (92%). All procedures were "technically successful and safe, and no major complication was observed," Kumar and colleagues wrote.